This entry was posted on October 11, 2010 by Joe Kenyon. 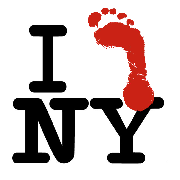 It was filed under Barefoot, Running, Travel and was tagged with Barefoot, Govenor's, island, John Durrant, NYC, Run. Finances are not an issue with Barefoot Buffalo. There are no membership fees to worry about. All you need to do is get to the run locations. If you need a ride, I’m sure that we will be able to work something out. Just start putting away a little cash here and there and you’ll be fine. Just $10 a month is $120 a year. I’m thinking that Saturday mornings may be the best time to start. How does meeting at Delaware Park sound?